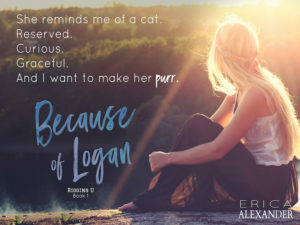 Because of Logan is a very well written book with a storyline that most people have lived or will go through to some degree in their lifetime. The author has written about characters that we can all relate to and the story is told in such a way you’ll feel like you’re right there watching the wondrous events unfold right before your eyes. Simply Wonderful. Finding your one and only is not always an easy road. Especially when your past relationships have caused pain, mistrust and heartbreak. All of this is true for Skye. Add in the fact she is shy, bookish and has always taken a backseat to her twin sister, River. But one night she is pulled over by a police officer, Logan, for a broken taillight. Logan and Skye seem to have an instant spark. But Skye and Logan both have scars from the past. Scars from past relationships and family issues. Logan bumps into Skye again at the neighborhood coffee shop and he convinces Skye let him take her on one date. A special date for her upcoming 21st birthday. Will one date turn into two? Can these two find a way forget the past and move on or will their inner struggles constantly be a barrier between them and any kind of happiness. 2 Thumbs up for a great read. This is a Flirty, Fun, Tender and Heartwarming book that I HIGHLY Recommend reading, you won’t be sorry.